Our most elegant offering with top-of-the-line details. Make your photo book as special as the day with a range of page and cover options. Are you helping your little one turn their young author creation into a beautifully bound book? Have you been looking for an elegant way to display your favorite photographs of the year? A custom book is the perfect way to showcase your unique story. Shutterfly makes it easier than ever to turn images of your original artwork into elegant books perfect for displays, coffee tables and gifts. Take your favorite pictures and tell your personal story. With Shutterfly, simply take your precious memories and turn them into beautiful products you can admire every day. 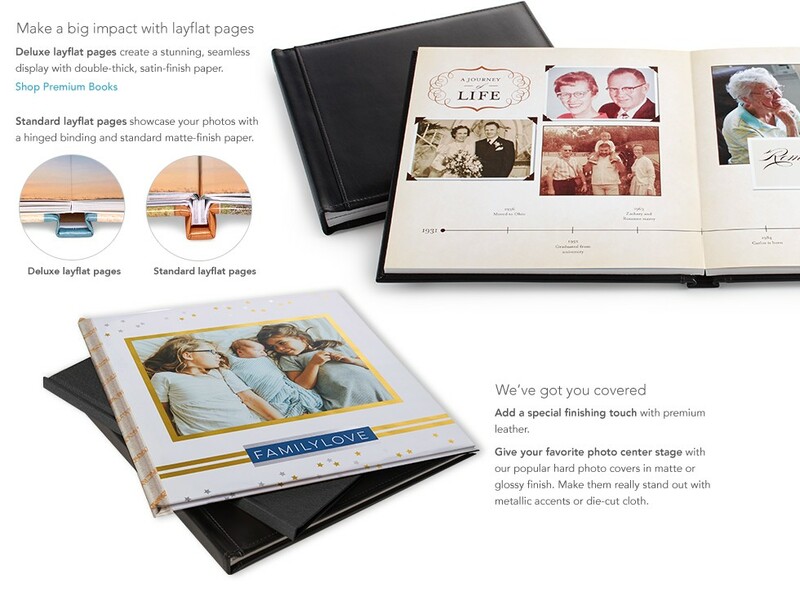 To create your own custom book, upload all of your favorite images to Shutterfly. When designing a book, simply choose your favorite template from our stylish selection and arrange your pictures with the easy-to-use design assistant. Shutterfly can help you add design elements, create custom text and choose your finishing touches for a one-of-a-kind book that is all you. The options for creating personalized books are endless. They make great gifts for grandparents for birthdays and holidays. Simply gather the best pictures of the entire clan and tell your family’s story. A polished photo book is a great marketing tool for an artist, business owner or entrepreneur to have on hand to help tell their story. Showcase (and show off) your photo collection, be it your fur baby, flowers or whatever your favorite subject might be. Kids also love photo books, and they are great projects for the both of you to work on. Have them gather their favorite pictures of friends, family and the year’s events and make their very own personal yearbook they can treasure for a lifetime. Use a custom photo book to commemorate a wedding, as a gift for newlyweds or from the newlyweds to their parents. Your favorite pictures and images can be turned into products you use or see every day. To keep your thoughts organized, a custom photo journal is a fantastic option to put those ideas into one place. Sometimes, your story isn’t best told through a traditional book but through a quilt. Shutterfly can help you turn your memories into a beautiful photo custom blankets. If you just want to highlight a few of your favorite photographs, personalized stickers are a neat way to use them. Shutterfly is here to help you turn your most precious memories into beautiful objects you can use every day. Photo books are an excellent way to capture all of your best pictures in one place.